When light propagates through a material with a χ(2) nonlinearity, the resulting nonlinear polarization has a quasi-DC component, i.e., it has a non-zero average value. This is because the optical nonlinearity can not only generate frequency components of the nonlinear polarization related to the sums and differences of the involved optical frequencies (→ sum and difference frequency generation), but also a component the frequency of which is the difference of some optical frequency with itself, i.e., zero frequency. For light beams with approximately constant or slowly varying optical power, the occurring quasi-DC (low-frequency) nonlinear polarization usually has no noticeable effect. In case of ultrashort pulses, however, the strength of the quasi-DC component rises and falls off rapidly, and that leads to the radiation of an electromagnetic single-cycle pulse with a wide frequency spectrum, ranging roughly from zero frequency to some maximum value, where the overall bandwidth in the phase-matched case is essentially determined by the inverse of the pulse duration. For an optical pulse with a duration of 100 femtoseconds, for example, the resulting radiation pulse has frequency components going beyond 10 THz (→ terahertz radiation) and can also be considered as far-infrared radiation. Due to the low frequency of the generated radiation, the radiation for a given strength of the nonlinear polarization is very weak. The achieved conversion efficiencies are often very low – in the best cases, a couple of percent. The generated terahertz bandwidth is typically comparable with the pump pulse bandwidth, but that bandwidth is very large compared with the mean terahertz frequency. That implies, for example, that the radiation efficiency and the strength of diffraction effects vary strongly within the pulse spectrum. The used crystals often exhibit substantial absorption in the terahertz regime, whereas parasitic absorption in the optical domain is often very weak. In some cases, the refractive index for the terahertz waves is far larger than that for the optical beam, which strongly limits the choice of phase-matching schemes. Traditional inorganic nonlinear crystal materials like lithium niobate (LiNbO3) and lithium tantalate (LiTaO3) are widely used. They are relatively robust and readily available in large sizes. In some cases, organic crystals like DAST = 4-dimethylamino-N-methylstilbazolium tosylate, OH1 = 2-(3-(4-hydroxystyryl)-5,5-dimethylcyclohex-2-enylidene)malononitrile and DSTMS = 4-N,N-dimethylamino-4'-N'-methyl-stilbazolium 2,4,6-trimethylbenzenesulfonate are used , which typically exhibit a very strong nonlinearity (with electro-optic coefficients >100 pm/V, two orders of magnitude higher than for typical inorganic crystals). This allows the efficient terahertz conversion even for moderate optical fluences. Some organic materials can also be used in polymeric (rather than monocrystalline) form; the required χ(2) can be generated by electric field poling . Various semiconductors are also suitable, e.g. gallium arsenide (GaAs), gallium phosphide (GaP), cadmium telluride (CdTe) and zinc telluride (ZnTe). The used nonlinear interaction is not necessarily based on a χ(2) bulk nonlinearity, but can also result from the combination of a static surface depletion field and the material's χ(3) nonlinearity, particularly for high pulse fluence. In any case, substantial power conversion efficiencies are possible only if phase matching of the nonlinear interaction is achieved, or if at least the phase mismatch within the crystal length is not too large. There are different phase-matching schemes which can be applied in different crystal materials. For example, simple collinear phase matching can be achieved for optical pulses in the 1-μm spectral region in gallium phosphide (GaP). Other crystal materials allow phase matching for other optical wavelengths, for example gallium arsenide for 1.3 μm; the phase-matching bandwidth is quite large, so that even operation in the 1.5-μm region is possible with reasonable crystal lengths. In other materials like lithium niobate (LiNbO3), the refractive index for the terahertz waves is much too large for collinear phase matching; here, one can employ a Cherenkov phase matching scheme, where the generated radiation is coupled out on the side (e.g. with silicon prisms attached to the side of the nonlinear crystal in order to suppress total internal reflection at the crystal–air boundary). In some cases, angular dispersion (i.e., tilted pulse fronts) is used [10, 16, 27], achieving relatively high conversion efficiencies in the regime of high pulse energies. In other cases, quasi-phase matching in periodically poled crystals is employed ; even backward-emission, leading to narrowband THz emission, is possible without requiring excessively small poling periods [7, 23], since the wavenumber of the terahertz radiation is small. Terahertz generation by optical rectification of femtosecond pulses is possible even in gases like air, when a plasma is generated by the superposition of an infrared beam with its second harmonic . Careful phase control of the involved waves is necessary for a high conversion efficiency. Compared with optical rectification in crystals, the emission bandwidth is typically higher, and higher pulse energies can be obtained. 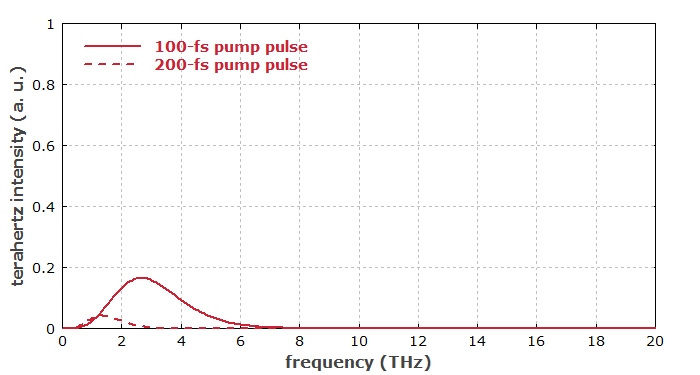 For various reasons, shorter pump pulses allow for much higher terahertz pulse energies. The radiated amplitude is related to the charge acceleration, i.e., to the second time derivative of the polarization, and the radiated intensity is proportional to the square of the amplitude. Therefore, the power radiated by a sinusoidally oscillating dipole is proportional to the fourth power of the oscillation frequency, if a certain oscillation amplitude is given. The energy radiated per oscillation cycle is therefore proportional to the inverse third power of the pulse duration, if the peak polarization is constant. The same holds for the radiation caused by optical rectification with a single pulse, which can be considered to cause a single oscillation cycle of the nonlinear polarization. The radiated energy is also proportional to the square of the oscillation amplitude of the nonlinear polarization, which itself is proportional to the square of the electric field strength, thus to the optical peak power, and therefore inversely proportional to the pulse duration for a given pulse energy. In conclusion, the radiated terahertz energy increases very strongly when the pulse duration is reduced while the pulse energy is kept constant – and this is only partly due to the then higher peak optical intensity. As mentioned above, shorter pulses also imply a larger bandwidth of the terahertz pulse. Figure 3 shows the terahertz spectra for the two cases. The influence of the pulse duration is also illustrated in the following figures, using a very simplified model, which ignores details like imperfect phase matching, frequency-dependent diffraction and absorption. Although the peak power is the same in both cases, the generated terahertz electric field is much stronger for the shorter pulse, because the second time derivative of the nonlinear polarization is much stronger. 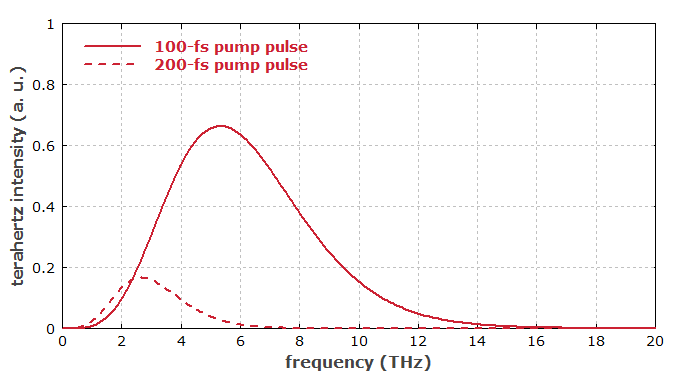 Figure 1: Optical intensity and terahertz electric field for a 100-fs pump pulse. Figure 2: Optical intensity and terahertz electric field for a 200-fs pump pulse. Figure 3: Spectrum of the terahertz radiation generated for different pulse durations. Due to the long wavelengths of terahertz radiation, strong diffraction effects occur. A longer length of the used nonlinear crystal can in simple cases increase the obtained terahertz pulse energy in proportion to the square of the crystal length – similar to the case of frequency doubling, for example. However, various detrimental effects can reduce the beneficial effects of an increase crystal length, even if perfect phase matching is achieved. In particular, there are strong diffraction effects due to the long wavelengths of the terahertz radiation (typically of the order of hundreds of micrometers): even if the laser beam can have an approximately constant beam radius throughout the crystal, the terahertz radiation generated in the beginning can transversely expand before reaching the crystal end, and that does not only cause a larger output beam, but also degrades the conversion efficiency (similar to spatial walk-off in other nonlinear interactions). Also, there can be substantial absorption for the terahertz radiation in the crystal material. This is particularly the case when the involved frequencies reach phonon frequencies of the material. Due to the already mentioned diffraction effects, tighter focusing of the laser beam is also helpful only to some limited extent. High laser pulse energies allow one to use only mild focusing of the laser beam (while maintaining high intensities), so that diffraction effects are weak. Accurate calculations of the nonlinear conversion with rectification generally require quite sophisticated numerical models. Wavelength-dependent diffraction of the terahertz wave generally needs to be taken into account, possibly also diffraction of the optical pump beam. Pump depletion effects can occur in case of substantial power conversion. In addition, two-photon absorption may attenuate the pump wave at high intensity levels. Group velocity dispersion can be relevant, possibly also angular dispersion and the group velocity mismatch. In some materials like LiNbO3, a polariton resonance can enhance the effective nonlinearity .